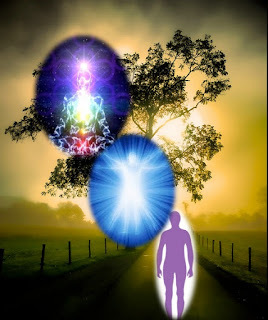 “Just as we have spoken to the ascending ones about having to connect their third/fourth dimensional self with their fifth dimensional SELF, you will need to connect your fifth dimensional SELF with your third/fourth dimensional self. We, the formless ones, are asking those who are more accustomed to wearing a form to interface between the higher, formless realities and lower realities of form. “Welcome. We on the Mothership are greatly pleased that you could tune into our transmission. During this visit, we will address the topic of your Lightbody. The element of your Multidimensional SELF who serves as that interface between your Multidimensional SELF and your earth vessel is your Lightbody. Your Lightbody connects the physical body with the Higher Expressions of SELF. “The physical body is NOT capable of accepting the full download of your Multidimensional SELF. Fortunately, your Lightbody serves as the buffer and connecting energy field between your physical body and your higher dimensional expressions. The fourth dimension is an etheric interface between the third dimension and the higher worlds, but it is too riddled with polarity and fear to effectively connect the third dimension with the higher worlds. “However, your Lightbody can easily move through the fourth dimension and directly connect the fifth-dimensional realms with your physical body. Still, there is often the sensation of crossing many voids as your Multidimensional SELF extends your Lightbody down from the higher worlds, through the fourth dimension and into your earth vessel. “These voids are actually initiations to assist you to release yet another component of your ego from your fourth, then third dimensional aura. Sometimes, these initiations are primarily experienced in your body, other times in your mind, your emotions or even your spiritual life. These initiations occur because you are bending down to jump higher. In other words, you are clearing out old anchors of fear so that you can more easily sore into the higher worlds. “Another challenge/initiation that occurs when your Lightbody is fully connected to your earth vessel is that you will likely experience great perceptual confusion. When your fifth dimensional senses begin to overtake your physical senses may perceive both frequencies, but in a jumbled and confusing manner. However, with practice you will be able to discern the difference between the physically based input and the higher dimensional input. Then, by constantly choosing to attend to your higher dimensional input, you are consciously choosing to release your physical world and attach your attention to the higher frequency of reality. “Please remember, the reality that you choose to perceive is the reality that you choose to live. Therefore, you are creating your own reality by the choices you make about the frequency of stimuli to which you attend. As you remember that you have the Power to make this choice and the Wisdom to primarily focus on that, which feels like Love, your formerly unconscious ascension process becomes conscious. “Your ability to make a conscious perceptual choice is, also, an antidote to fear. If you are consistently conscious of the fact that you have a choice about what you wish to perceive, you will fully realize that that YOU are creating your reality. Additionally, if you are in constant contact with your Higher Expression, you will be able to ask questions in order to clarify your process. This sense of control of your ascension, as well as the constant source of enlightenment, will greatly expand your ability to attend to love and ignore fear. “The ascension process may seem very unique to your human self, but is common for your Higher Expression. Once you surrender your ascension to your Higher Expression, the ego’s firewall of the Reticular Formation within your physical brain will be superimposed with the "Spiritual Screening System" of your Higher Expression. Once you process data through your spiritual perception, you will be able to easily discern which physical communications are important enough for your attention. “In this manner, you can relax into the process of recalibrating your attention away from the myriad illusions of the 3D and onto the Truths of your ascending reality. When you surrender to your SELF, you can relax into the knowledge that if there is a physical message to which you must attend, such as driving your car, paying a bill on time, or answering the phone for an important call, your ego can remain relaxed as your Higher Expression is on duty. “This type of working relationship with your SELF is your most important preparation for living in a fifth dimensional reality. When you live in a higher reality in which your every thought and emotion instantly becomes manifest, it is vital that your internal filtering system filters OUT any thoughts or emotions which you do not wish to manifest. “During your long sojourn into the worlds of matter, you have allowed your emotions and thoughts to focus on fear. Fear is a necessary component for survival in the lower worlds as Power Over Others is the dominant form of behavior. Also, many humans have completely lost their connection to the Great Mother. “When your society was in touch with Mother Earth, you could determine the weather, co-exist with the animals and know which plants to eat. However, now many humans perceive nature as dangerous. This danger does not exist in the higher frequencies of reality in which people and planet are ONE Being and Power Within is the only operating system. “In a higher dimensional reality, if you are afraid, or think that someone or something would harm you, your consciousness instantly drops back down into the fourth dimension. Your state of consciousness determines your perceptions and the reality you perceive is the reality you live. Hence, when your consciousness drops below the resonance of the fifth dimension, you can no longer perceive or live within that frequency of reality. “Fortunately, your Multidimensional SELF is similar to a huge ladder that your consciousness can climb to interact with different frequencies of reality. Thus, you do not need to become better or more deserving to enter a higher frequency of reality. You only need to attune your consciousness with the appropriate resonance of your Multidimensional SELF to be able to perceive and interact with that frequency of reality. ”We, the galactic representatives of your own Higher Expressions, are very pleased to be able to speak with you directly. We know that your grounded expression may not remember that you are visiting with us. Luckily, some of the messages that YOU are receiving will bleed-through from this frequency of your SELF and into your physical consciousness. “If your physical self can remember, feel, imagine or picture any part of our messages, it will greatly change your decision making in daily life. The single act of checking with your Higher Expression of SELF, rather than your ego self, before you make decisions will greatly alter your physical reality. “When you check in with your ego self, it does it job perfectly. It tells you that you need to be careful, that many possible problems may arise and that many persons, places or situations may be dangerous. This does not make your ego self a negative force in your life. Your ego self is just doing its job of keeping you safe. Since your ego self can ONLY perceive the physical reality, it can find myriad possible dangers about which you need to be warned. “You ego is incapable of knowing that that which you focus on is that which you manifest. Ego does not realize that it is actually creating the very situations that it is warning you to avoid. It is true that naivety can be dangerous in the physical world, but only if you are NOT connected to your Higher Expression. “Your Higher Expression can see any possible harm even more clearly than you ego. However, instead of saying, "LOOK OUT," which only creates the very fear that you are in danger of attracting, your Higher Expression simply guides you away from that possible reality by revealing a higher resonance of choice. “This higher resonance of choice is your protection because it keeps your thoughts and emotions in a frequency that pulls your energy field above any interaction with any fear-based, possible reality. However, there is one issue that is often confusing to our ascending ones. This is the issue of clearing old darkness. There are some times in your physical life in which you are ready to clear old darkness/fear from your consciousness. “During these times you may experience a bad thing happening. This does not mean that your Higher Expression has been slacking from its duty. No, this event is one that you cannot go over, under or around because it is an important initiation. In other words, this ‘problem’ is actually an initiation that you chose before your present incarnation. “These initiations are not enjoyable, but they represent that you are ready to move into a higher resonance of reality. You can take a great deal of time going through this challenge, or you can surrender to the ONE and allow your Divine Guidance to guide you through the parting seas. Then, you can get on with the important business of personal and planetary ascension. “We, the members of the Arcturian Mothership, are joyous that you have joined us. We now complete this transmission and ask only that you try to remember our words and use them in your daily life. “Because your appearance is quite human, you will spend some of your time walking among the ascending ones. You will easily see their Higher Expression of whom they may appear completely unaware. One of your primary challenges will be to allow each human to come into awareness within their own ascension schedule. Remember to live within the Flow of unconditional love and send that love to everyone with whom you come into contact. Most important, remember that we, your Arcturian friend and guide, will ALWAYS be with you. “You will be informed of the appropriate clothing for each area you visit, so that you can better create the illusion that you are ‘one of them.’ As you blend in with the crowd, you will hear their thoughts and be able to identify those who are open to meeting you. Remember, you will appear quite physical to the earth ones, but you can easily transport out of any situation that may become dangerous. “At this pivotal, transmutional time, the escalation of Earth’s energy field can create sudden, erratic behavior in some humans. This behavior will usually occur in those who have not expanded their consciousness enough to integrate the higher frequency of light. Therefore, you will primarily visit the ‘Islands of Light’ that are developing on Earth. “These areas have a greater percentage of ascending ones who are consciously, or unconsciously, sharing their light with Gaia. These humans may even recognize you, or at least perceive your expanded aura. Therefore, they are more likely to call upon and accept your assistance. On the other hand, many ascending ones will likely see you as a normal human. It is best to allow that illusion. “Please remember that we will be in constant contact with you. Thus, you will be instantly informed of any changes. If you get in a difficult situation, just call us, your Arcturian friend, and we will instantaneously assist you. Just as you will be telling humans to remain in contact with their Higher Expression, we remind you to stay in constant connection with your Higher Express, WE the Arcturians! Mytria and I looked at each other and then the Arcturian. How could we express our gratitude for what the Arcturian had done for us? Instinctively, we both stepped into the vast aura of the Arcturian in a vain attempt to hug It. However, how do you hug a wavering energy field? Hence, we began laughing, while trying not to cry. I could keep reading the whole day! Wish you'd post every day but I understand ofcourse that this takes alot of efford and time and I'd like to express my gratitude again to you Suzanne and the Arcturian(s), Mytre and Mytria. All this is extremely interesting and helpful. The clarity, flow and overall vibe of these messages are one of a kind! I get more and more excited every day about what is to come next! On a personal level I have noticed that I have become much better at remaining centered during stressful situations and controlling my emotions. I feel exactly as Seb feels. I continually check ur blog for updates and I soak up every message like a sponge. Thank u for ur service to us and Gaia! Your messages are being translated in Japanese by a member of our group, a Japanese lady named Rieko.